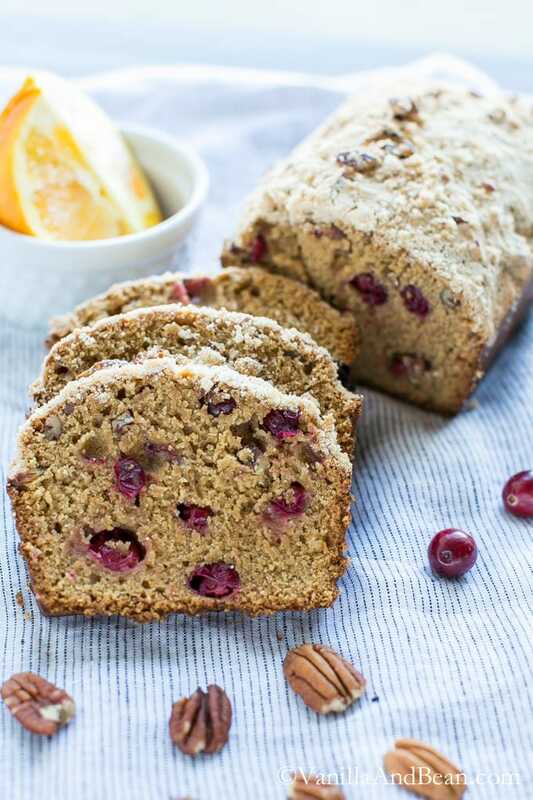 Cranberry Orange Bread with Pecans is a delicious vegan quick bread made with wholesome ingredients like coconut sugar, applesauce and whole wheat white flour. 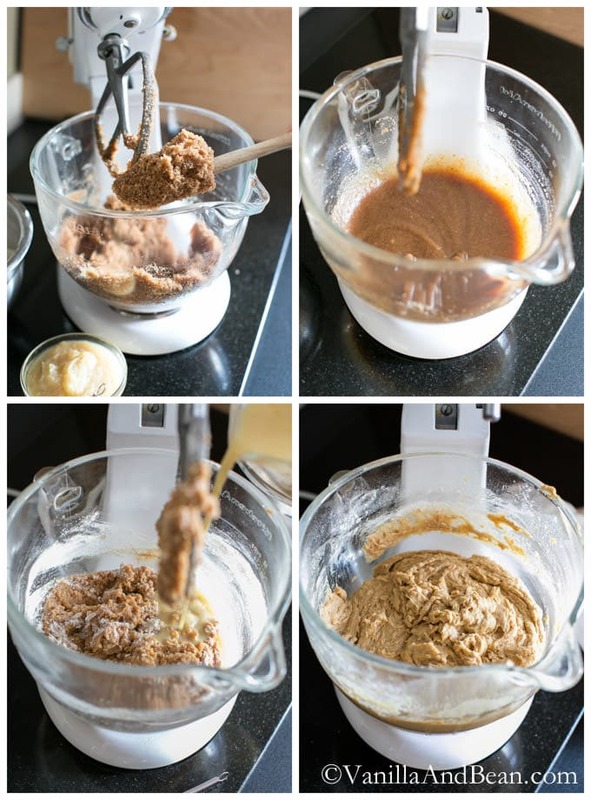 Make a loaf or muffins or both! It’s cranberry and orange season! I’m sending y’all a delicious, warming sweet bread to kick start your frozen mornings. So many flavors are dancing around in this bread; if you like cranberries, you’re in for a treat! I adapted my cranberry orange bread with pecans recipe from one of my go-to baking books, The Grand Central Baking Book. I’m learning more about vegan baking so I decided to try Grand Central’s recipe with some ingredient substitutions. We love the results! I also bumped up the amount of orange zest, used 1/2 white whole wheat flour versus all, all purpose flour and instead of all white sugar, I used about 1/2 coconut sugar. Y’all know I’m a streusel fan, so I added a nutmeg pecan streusel. Optional, certainly, but it lends a very nice, yet subtle crunch to the top. I toasted a slice this morning, adding to the crunch factor… is your mouth watering yet? My neighbor was over directly, picking up a 1/2 loaf to enjoy! Quick breads are just that. Quick. I used a stand mixer to get mine going, but this bread can be made in a bowl with a strong arm and sturdy whisk. Consider making a loaf for a gracious host or hostess gift or for a fabulous offering at the office potluck. 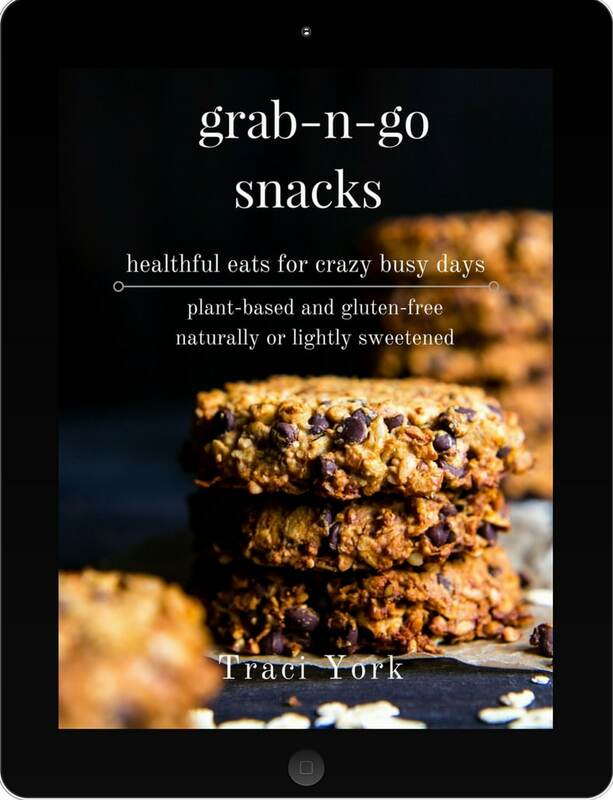 Good for snacking in the morning or afternoon. I’ve included instructions for both muffins and a loaf(s) to suit your baking needs. Muffins are great for a quick grab snack, and a loaf makes a nice gift or festive presentation, especially when sliced. Warm, and toasty with flavors reminiscent of the holidays, this Vegan Cranberry Orange Bread with Pecans makes a heartwarming hostess gift or a delicious morning or afternoon snack. This recipe yields two loaves or one loaf and nine muffins or 18 muffins. Prepare loaf pan by spraying or rubbing coconut oil in pan. 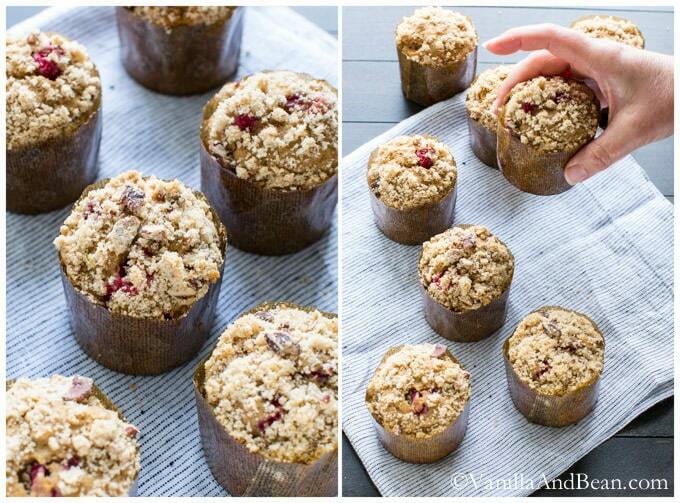 If using muffin cups, line a muffin pan with cups. Or use mini panettone cups and line a pan with parchment or silpat to set the muffin cups on. While the oven is preheating, toast the pecans for the bread and streusel for about 15-18 minutes. They should be fragrant and toasty (watch them carefully as they go from toasty to burnt quick!). Set aside to cool, then rough chop 1/2 C for the bread and finely chop 1/4 C for the streusel. Sift together the whole wheat and all purpose flour, corn starch, sea salt, baking powder and nutmeg. Set aside. In a spouted measuring cup combine the almond milk and apple cider vinegar. Whisk. To the milk mixture, add the orange zest, juice and vanilla extract. Whisk again and set aside. Add 1/2 the sifted ingredients to the sugar/oil mixture and pulse just until combined. Add 1/2 the milk mixture and pulse just until combined. Add the remaining flour mixture, pulse in, then add the rest of the milk mixture. Pulse until ingredients are combined. Fold in the rough chopped pecans and all the cranberries. Fine chop the cooled pecans. Mix the flour, pecans, sugar, salt and nutmeg in a small bowl. Add the warmed coconut oil by teaspoon full to the flour mixture, mix well. Clumping is ok.
Divide the bread mixture evenly between loaf pans, a little over 1/2 full each. Use the back of a butter knife and run a slit down the center of the bread. This will help it rise evenly. If making muffins, fill the muffin cups to a little over 1/2 full each as well (about 106 g). If adding streusel, spoon the streusel evenly over the bread and/or muffins. For muffins, bake for 30-35 minutes turning once after 20 minutes. For a loaf, bake for 65-70 minutes turning once after 30 minutes. Test for donness by inserting a toothpick in the center of the muffins/loaf. It should come out clean when done. *If coconut sugar is unavailable, granulated sugar can be used instead. Just made this bread for Thanksgiving! Dealing with a whole bunch of food allergies and this was a perfect treat. I used gluten free flour and the results were fantastic! Can you just use all white whole wheat flour? Hi Angel! You could, although I’ve not tried it in this recipe. If you do try it, let the batter rest for about 5-10 minutes before baking so that the whole wheat has additional time to hydrate (this will soften the texture of the grain). The texture will be a bit different then what I’ve developed here, but I am sure still delicious. If you give it a go, let us know how you do! Oh orange and cranberry is the most delightful combination! Easy, why yes! They are cute little wrappers, eh? Holidayish, yes? Thanks Olivia! YES! Bring on the cranberry orange season! I love that combination and the streusel takes it to the next level. Love streusel. I was delighted to see white whole wheat flour in your recipe. It’s such a wonderful alternative to traditional whole wheat, yet packed with the same nutritious benefits. For a while, I played around with whole wheat pastry flour. But my preference is white whole wheat for my quick breads and muffins. My kids love it. And I prefer the texture. Thank you Emilie! What is it with streusel!? I’ve been contemplating that question… do I want to include it on this recipe or not? I’m finding the answer is always yes! I think its the subtle crunch.. and light sweetness. Isn’t WWWF fabulous!? 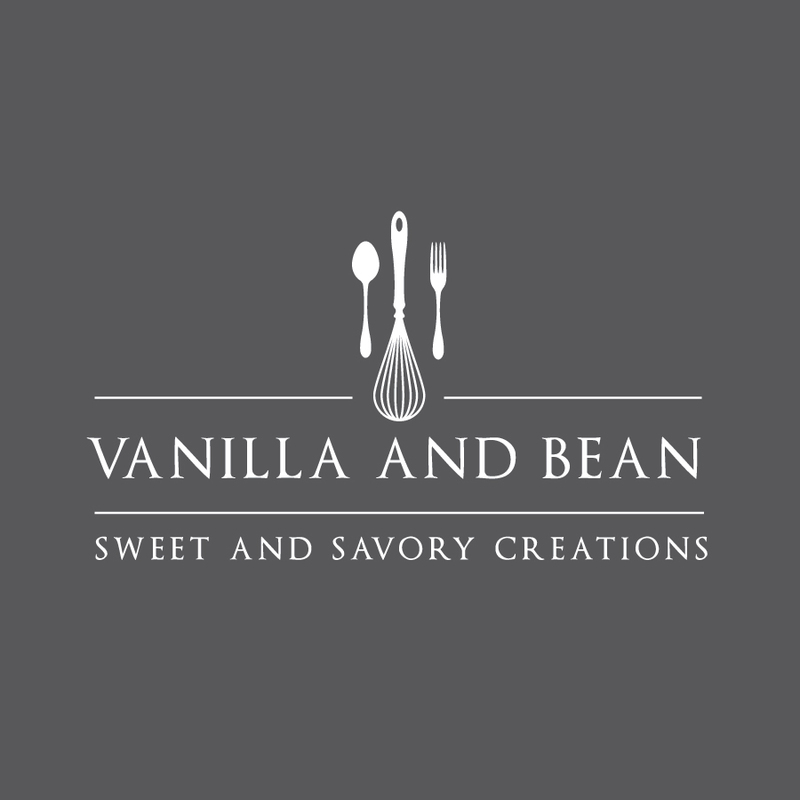 I love working with it and am going to keep playing around with it up even more in my baked goods. Others, not so much… The texture is very nice! I can so smell the orange and the cranberry baking in my oven right now! To top it off I have most of the those ingredients. Even the coconut sugar. Yay! My sister can’t have dairy so I’m super excited to make these for her. As always, great photography and nice work. Traci, this looks delicious! As you know I’m also a big fan of cranberry orange bread, so I had fun looking at your version. I love your idea to use apple sauce and to also make the batter into muffins. And streusel makes everything better, doesn’t it?! Thank you, Julia! 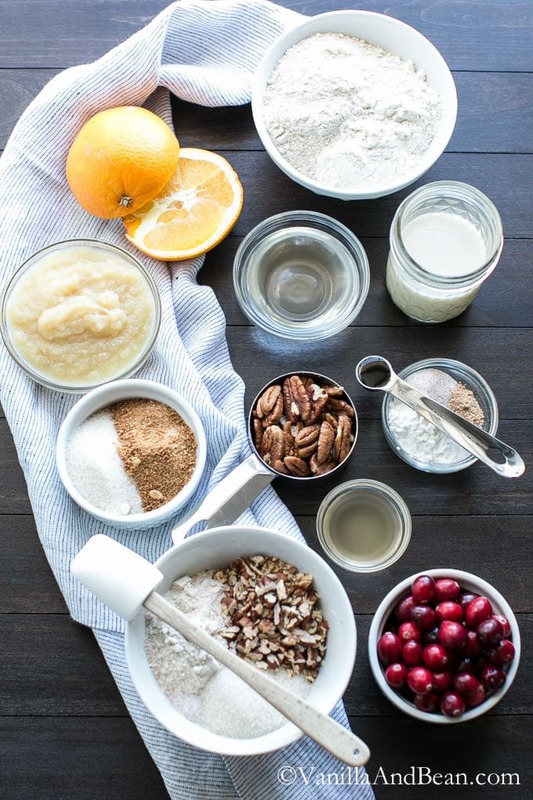 Indeed, streusel does make everything better… and there’s so many different varieties! I am out of cran orange bread (it went fast) and I’m thinking about whipping out another batch. We really enjoyed it! I made a cranberry orange bread last year but it doesn’t look nearly as gorgeous as your! I seriously can’t stop starring at your gorgeous pics!! Awwh, Tina :D Thank you! Traci! I actually started salivating seeing those big juicy cranberries! I love that sour POP they give baked goods, cutting the sweetness perfectly. And those beautiful baby panettone-type liners are gorgeous! These would be a lovely gift. But I wouldn’t give any away hehe. Hehe.. a bit of mouthwatering to start your morning? :D I like to fancy up my muffins in those little wrappers… makes the experience more fun! 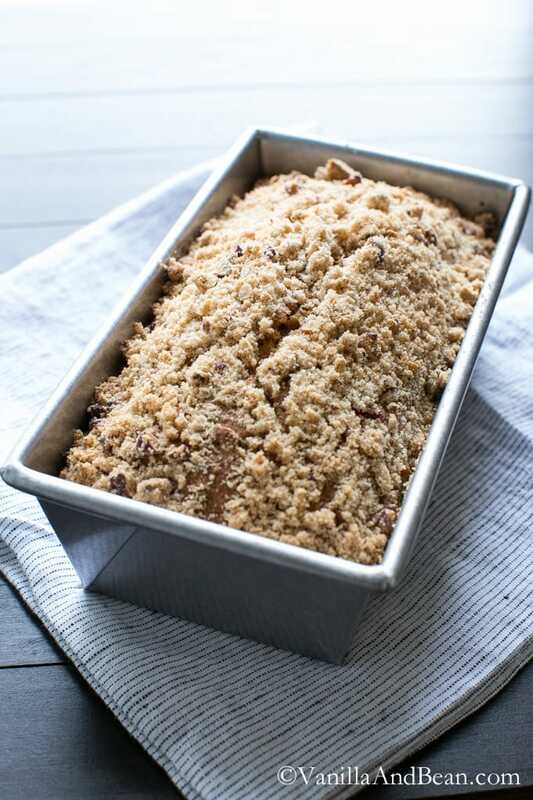 I love a fruity bread – add in the pecans and a streusel topping (I’m definitely adding the streusel) and it’s just perfect. I’ve been looking for baked good gifts and these muffins will be perfect. Great pictures as always. Thanks so much for a great recipe, Traci! Hi Geraldine! It’s all about the streusel, eh?! I bet you like panettone and stollen? I love em, but they have to be done with homemade candied fruit… none of this artificial food colorings injected into the fruit (bleh!)! I love giving loafs as gifts too. People love homemade bread (even quick sweet bread!). Thank you, Geraldine. 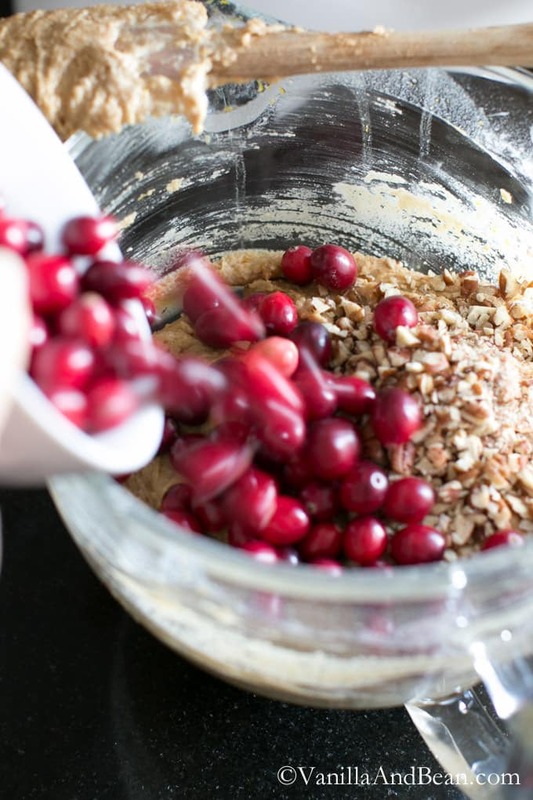 I love, love, love that you used fresh cranberries! You’re so damn elegant, Traci.. stop it! And I cannot get over how pro those muffins look! Girl! Why thank you, Cheryl. :D The fresh cranberries are just lovely… so tart and balance well with the sweetness of the bread. Pro?… LOL. You always make me smile! So beautiful! I love that you gave us both muffin and bread instructions! Must try! Thanks Deb! Hope you and yours enjoy the recipe! This bread looks wonderful. I don’t usually bake with fresh cranberries but the bread has inspired me to do so. Love it! Hi Jen, and thank you so much! Go get those fresh cranberries and DO IT!! They are different then their shriveled up and sweetened siblings, but oh so delicious! The bread and muffins look amazing Traci! 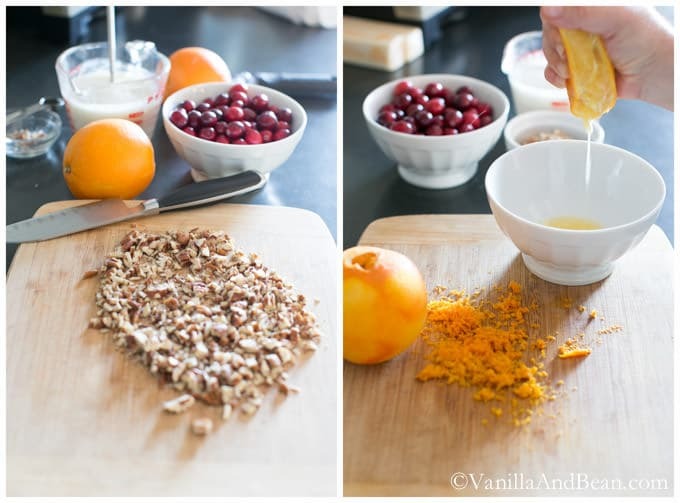 I love baking with fresh cranberries and combined with orange it makes a wonderful combination! Beautiful and inspiring pictures as usual! Pinning! Thank you for your sweet encouragement, Mira! And thank you for pinning! Gorgeous! I’m loving the muffins in those cute mini-panettone papers! Aren’t those little wrappers so cute? They give those muffins a bit of a polish! Thanks, Allie!